Ruderer (formerly: Isarplast) is a toluol-free, synthetic resin based solvent adhesive which is excellent for relatively limited surface area bonding work on materials like polystyrene, ABS, PVC, PET-G, acrylics and celluloid among themselves as well as for general bonding of metal, ceramics, glass, wood, cardboard, etc. When working with PET-G or making bonds between plastic and metal, we recommend preliminary tests. Ruderer cannot be used with PE, PP. PET, Teflon and silicone. 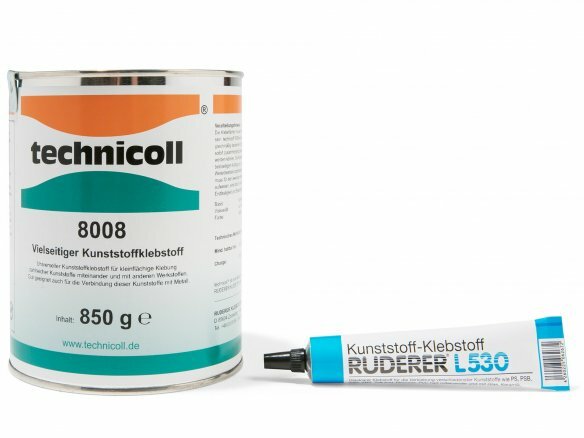 The adhesive has a low viscosity and when cured is colourless and transparent. The clean, grease-free assembly pieces and surfaces must fit perfectly to one another and be free of fissures. Plastic pieces with internal stresses should be tempered before any bonding work so as to avoid stress fractures. The work should be done wet-on-wet – which means the surfaces that have the glue applied must be joined right away at room temperature without any airing time because the Ruderer dries extremely quickly. The thermoplastic plastics are solvated by the solvent and also undergo bonding along with the gluing substances. In the case of planar bonds, both sides should have glue applied in a thin coat with a brush; for smaller bonds, a single side application using, for example a SYRINGE, suffices. Depending on the composition of the assembly piece surface, between approx. 150 to 250 grams of glue per square metre is required. The assembly pieces should be pressed together until the required bond strength has been attained – in the absence of stress forces, this should take no longer than 5 to 10 minutes. After about 3 days, Ruderer achieves its maximum bonding strength. P241: Use explosion-proof [electrical / ventilating / lighting / …] equipment.